Not great on stairs or need lifts, ramps and bathrooms for wheelchairs? Asia is not famous for catering for travellers with mobility issues. These villas at least try. If you do need more help though do contact us and we will do what we can. Mandalay is a rare slice of heaven. Its tranquil setting instantly relaxes the mind and makes work feel like a distant memory. 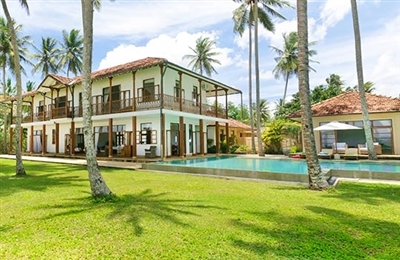 Despite its out-of-the-way location (it takes 25 minutes to drive to Galle), it doesn’t feel completely cut off from the outside world as you can always enjoy the endless theatre atop the lake and watch the enthusiastic play of wildlife in the garden. Although the villa makes a lovely retreat for a group of friends (it’s a great place for entertaining) there could well be some room-envy as the master bedroom is far bigger and more decadent than the other two (although the soft furnishings in each of these downstairs bedrooms were upgraded in 2013). For families or a decadent couple, Mandalay is an excellent choice. There are beaches within easy reach and plenty to explore in the locality. 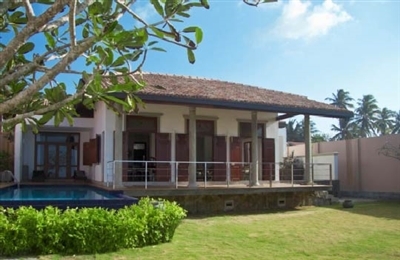 The villa has a very generous swimming pool and a flat open garden that makes keeping an eye on the kids a breeze. The lounge in the main house, with TV and DVD player, is great for keeping the kids entertained at night and can also be used to sleep two more guests since the built-in sofas are the size of a single bed whilst the room itself is air conditioned. The friendly cook (who’s also the villa manager) prepares some great meals; his rice and curry comes highly recommended, and he can prepare western dishes too. The staff leave you to your own devices which heightens the villa’s sense of privacy and seclusion. 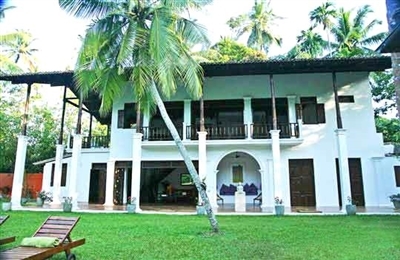 We loved everything about this fabulous house, perched on Habaraduwa’s beautiful beach. The two upstairs suites are very grand and open directly onto a balcony that wraps around the top floor of the house and reveals incredible coastal views (you can’t really see the sea from the ground floor due to a screen of beach foliage, planted for privacy). The house is definitely designed for families, and the ground floor twin bedroom works well for independent teens or perhaps elderly relatives keen to avoid the stairs. The staff team are efficient and we had all of our meals cooked for us. Most memorable was our fabulous lunch of grilled tiger prawns followed by a delicious tropical fruit pavlova. Although there is no outdoor dining area as such, the staff can move the dining table onto the veranda or even set up lunch or dinner for you on the beach (highly recommended). We really liked the L-shaped swimming pool and its visibility/proximity from the dining area and living pavilion, as it made it easy to keep an eye on kids. Whilst the sea here can be rough at times (and there are no lifeguards), bathing is best during the high season (December to April), and for strong swimmers the rest of the year. If you do plan to take a dip in the sea, let the staff know and they can advise you on the best places for a bathe. We enjoyed three wonderful days at Saldana and adored the villa’s cosiness. Its design is grand but homely with the sea nearly always in view. The living room was especially comfortable and the front veranda is best sited to soak in the ocean vistas – drag a few chairs out there or even the dining table for a wave-chorused lunch as you count the lumbering ships on the misty horizon. The house and the swimming pool appear to float above the lawn and this aspect improves the airiness of the property. The two master bedrooms both have sea-view terraces, but the bedroom opening onto the swimming pool terrace is less private - fine if you’re a single family grouping or a couple but maybe less so if you’re a group of friends. It’s ideal for midnight skinny dips though! The twin bedroom is ideal for children although the high beds might be a worry for parents with younger kids. The kitchen is great and comes with everything that you’ll need if you’re looking to self-cater. The small staff team includes a cook who’s more confident in cooking Sri Lankan cuisine and simple snacks than elaborate western meals, but learning fast. The staff were always very discreet and gave us privacy, which we liked, although they were a little bit shy at times. Knowledgeable managers are on-call however, and they can help with restaurant bookings, massage appointments and onward travel. The turtle hatchery (0.2km) will be a delight for young children who can learn about the five species of marine turtles in tanks that come to lay their eggs on Sri Lankan shores. They’ll also have the opportunity to set new hatchlings free into the sea.